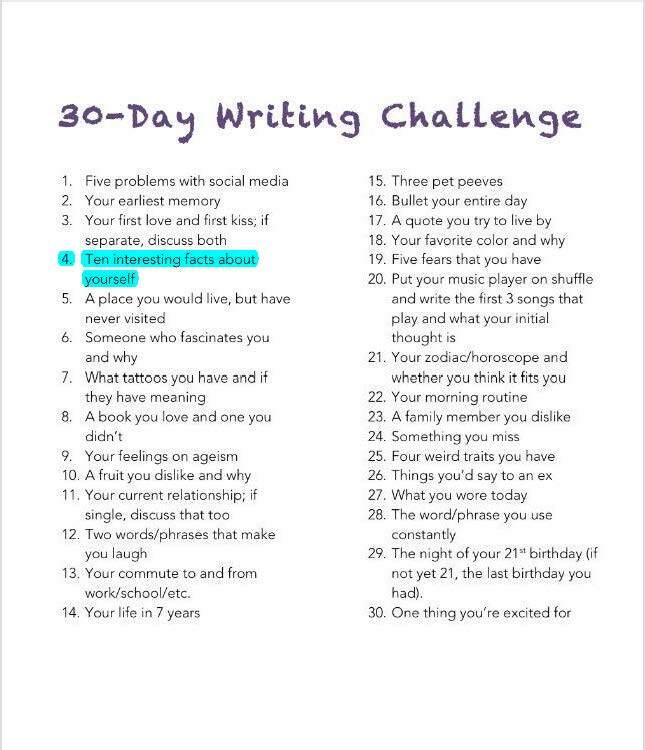 Read about my 30 Day Writing Challenge here! 1) I took voice lessons for about five years. I can sing. But I don’t really like singing solo in front of people. I will turn into a tomato with hair if I do. Seriously – I hate singing in public. 2) Added bonus to all of the years of vocal lessons and choir practice? It has helped me with foreign languages. 3) If I was exiled from America tomorrow, I’d go back to the Netherlands. I spent a week there in 1999 and it felt like home. 4) I did not like college. I prefer the paycheck and the “logic” of a regular job. Although I was blessed with so many wonderful experiences and made some lifelong friendships in college, my life took off as soon as I took my first job. I’ve never really doubted my place on this earth since then. 5) I’m a firm believer in back-up plans – especially when it comes to employment. It’s not uncommon for me to have a back-up for my back-up. 6) I am a voracious and a very fast reader. The caveat to my speed though is that I tend to skim passages. It’s one of the reasons I’m very happy to read books over and over again. I’m always catching stuff that I missed. 7) Speaking of books that I’ve read over and over again, here’s a brief list: The Historian by Elizabeth Kostova, Bag of Bones by Stephen King, The Stand by Stephen King, A Discovery of Witches by Deborah Harkness, the Mercy Thompson series books by Patricia Briggs, and Tregaron’s Daughter by Madeline Brent. I would cheerfully read all of these books again and again. 8) I’ve held an awesome variety of jobs: I’ve worked at gas stations, worked at an amusement park, as a reporter and editor in the newspaper industry, at a cab company, and currently at a software consulting company. In my adult life, I’ve always worked as a writer. Surprisingly, one of my favorite jobs out of all of those was the three-year stint I had as a dispatcher at a cab company. It turns out that truth IS stranger than fiction. 9) I still have a couple of jobs on my bucket list … barista and bartender. I figure those will be great to explore in retirement. 10) I honestly believe that I am one of the luckiest people in existence. I do work hard and I have taken some lumps, but at the end of the day, my life is extraordinarily blessed. I try not to take it for granted.